All transactions are safe and secure with a reliable history in online purchasing behind each of our associates. Buy the Do you play? 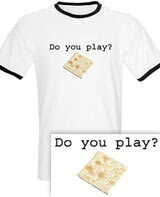 (Find the Saltine) t-shirt to own Scrubs clothing and merchandise. The Find the Saltine Scrubs t-shirt on the left celebrates the game that Zach Braff's Scrubs character, Dr. John Dorian, plays with his fellow physicians, most notably his best friend Dr. Christopher Turk (Donald Faison). The object of the game is to hide a saltine cracker somewhere on your body, and then have a participant try to "find the saltine." For example, in one Scrubs TV series episode, Dr. John Dorian hides the saltine behind his ear and Dr. Turk guesses the location correctly. In addition to the Do you play? (Find the Saltine) tee above, browse the Scrubs Clothing Gallery for more apparel like men's and women's clothes, kids shirts or hoodies.